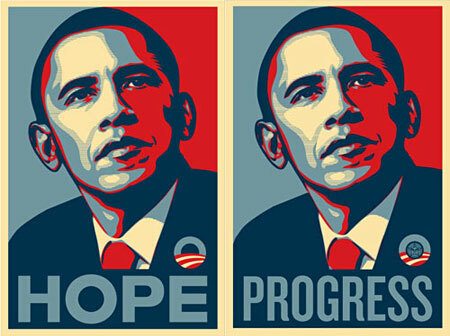 I think that most people who read Barack Obama’s “The Audacity of Hope” take away some very important lessons on how to make themselves better people and make the world a better place. I took away the name of a restaurant. Don’t get me wrong, I learned lessons and think that Obama would make a fantastic president. However, the most important thing in his book is that his favorite place to eat in Chicago is called MacArthur’s. This I took very seriously. MacArthur’s is located off the beaten path, in a fairly rough neighborhood. Don’t let that deter you. You’ll be rewarded. I don’t mess around with my food, so take it to heart when I say this is one of the best (and inexpensive) meals I’ve had in my life: smothered, fork tender pork chops; golden fried chicken; stewed, spiced yams, which perfectly complimented the pork chops; and, though lacking in bread crumbs, soul-warming mac-n-cheese. This place is as close to eating a southern grandma’s home cooked meal as you can get without being cooked by a southern grandma (mmm, country ham and fried corn). If you’re ever anywhere near Chicago, go here. By “anywhere near,” I mean anywhere. Go here, now. For more information on the story of MacArthur’s, read “The Audacity of Hope“. This marks the start of an ongoing series exploring markets around (and out of) town. There is a wide variety of price and quality, and I want to get to the bottom of it. Hopefully, by making smarter choices myself, it will help you to make smarter choices, too. So, let’s start closest to my apartment- the Albertsons located on Hillhurst in Los Feliz. The store itself has recently undergone a top to bottom renovation. Overall, the look is much improved- lots of wood decor, and a much more open feel then it previously had. Still, it retains a low-budget look throughout many of the center aisles. Guess you can’t dress a wolf in sheep’s clothing, eh. Selection here is sparse, both in terms of quality and variety. Standard chicken is offered- breasts, wings, whole birds, etc., and a small selection of commercially raised turkey is on sale, too. Coastal Range Organics provide the only organic chicken choice, with breasts going for $8.69/lb. The company is certified by the Organic Tilth, which is a promising endorsement. Personally, I’d rather the chicken come from Southern CA, rather than OR & WA, but you can’t have everything. Not bad. I wish I could say ‘not bad’ for the rest of the meat selection. Sadly, all I can say is ‘bad’. Pork choices are very limited, and nearly all are processed with solution for ‘added tenderness’. I prefer my pork to be tender thanks to good breeding and mother nature, not thanks to commercial horrors and chemicals. Nothing organic or free range. Pass. The beef selection is nearly as poor, with most of the sick looking cuts in the ‘choice’ and ‘select’ categories. They do have a ‘steakhouse choice’ selection, which looks a little better. I have no idea where the meat comes from or how it was raised. New York Strip goes for $11.99/lb. Also on offer is a tiny selection (ribeye and lamb) of Wild Harvest ‘Natural’. The beef was clearly more marbled than the other ribeye cuts, and fed a better diet. Not great, but the best in the bunch. $12.99/lb. Grade: D+. Albertsons has a long way to go in order to improve its meat & poultry. With the exception of the Coastal Range chicken, not much is worth buying here. Grade: A. Hits all the standards and show good promise in healthy choices. Kids and adults rejoice. Again, Albertsons does a decent job here. Just about any herb/spice can be found, with several varieties to choose from. Nothing too out of the ordinary, but a solid selection. There are some organic options on the shelf. Fair trade options were not to be found. Spice Island Garlic Powder is $6.99, and McCormick Gourmet Vanilla Beans are $12.99. Grade: B. Check elsewhere for gourmet & fair trade choices. If you live nearby and need something, you’ll have no problem. Since we’re on a roll with good thoughts, let’s start with the eggs. I was pretty surprised to find a good selection on cage free organic eggs. Four choices in fact! Not bad, Albertsons. For $4.49/dozen, you could do worse. Of course, the reason I was surprised at the good egg selection was the sad state of affairs in the rest of the dairy case. Oh, poorness. There were three choices of organic milk- the very commercial & not very cow friendly Horizon, Wild Harvest, and Heritage. All three are ultra-pasteurized, and only the Heritage is local. Wild Harvest is cheapest at $3.99/half gallon. Things get worse with the yogurt. The only ‘organic’ choice was a large jug of Horizon. After that, we were left with standard processed faire, containing more high fructose corn syrup than goodness. Grade: Eggs- A / Dairy- C-. Happy with the egg selection. In fact, you’ll probably only do better for freshness at a farmers’ market. Dairy scores a bonus for having at least one locally produced organic milk, but looses points for ultra-pasteurization, and sugar-laden yogurt. Grade: C-. Standard stuff. Nothing special. I will admit full bias here. In the last year, I’ve purchased at least 85% of my produce from the farmers’ market. There’s no reason not to. I’ll do my best to be generous. Well, there is certainly bounty aplenty here. You can get just about anything you’d like. Most of it looks very ‘standardized,’ by which I mean grown for hardiness and generic look, rather then for quality of flavor. There is a small selection of locally grown, organic produce. It’s limited to what’s in season, plus, strangely, kiwis flown from New Zealand. I love kiwis, so I can’t really complain. Ha. Peaches sell for $2.49/lb- comparable to those at the farmers’ market, and only 50c more than conventional. Organic raspberries go for $3.99 per package. Everything in the produce section is well labeled and contains a little description. I like that. Grade:C+. Pretty standard, but improving. I think this is really up to us. The more organics we buy, the better quality we ask for, the more they’ll do to improve the selection. I’m getting angry just writing about it. Just don’t buy sliced bread here. It’s all crap. Crap crap crap. Crap in bad packaging, crap in packaging the makes it look like it’s not crap, which in my opinion makes it even crappier. I think the crap crap crap we call ‘bread’ in America is a huge contributor to what makes us fat. Crap. It’s disgusting. Read about it in an earlier post. The one salvation is Milton’s bread, which you can find at the far right end of the section, buried under crap. It contains good stuff, and at $4.39 per loaf, is the same price as everything else in the bread section. Confusing. Grade: F- – – -. There is a nice organic aisle across from the produce section. Though limited in selection, you can do a pretty good job of grabbing some less processed choices of you need to run in quickly. Rice Dream is $2.29/32oz, Knudsen Just Blueberry is $9.29/32oz, Tea’s Teas (yum!) at $2.25 for a small container, and most Naked Juices are $3.99. Albertsons isn’t bad, it’s standard grocery store. If you work real hard and read a lot of labels, you can get a decent amount of food for a pretty good price. In a pinch, it’s a fair option. However, you’re not going to find anything high quality here. At best, you’ll find ‘good’. We should eat better. Plus, this is assuming you’re educated about food. For those that don’t know, or don’t care, there are just too many poor, processed choices available with better marketing displays for cheaper prices. That’s where the problem lies. Are supermarkets will only improve as we work to improve them, or go to stores that are already on the right path, thus hurting the mega-mart’s bottom line. 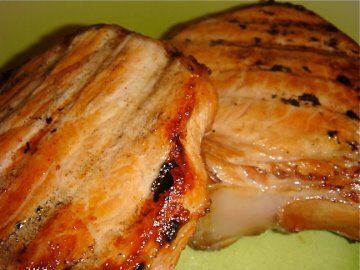 I picked up some really nice looking pork chops from the Hollywood Farmers’ Market yesterday. Since they looked so good to begin with, I went with a very simple preparation. Leave on counter for two hours, or refrigerate for up to 24. Grill chops over hot direct heat for 5 minutes per side. Easy as pie. Hell, much easier than pie. Pie making is hard. Last night, for the first time ever, no one busted my balls about snapping a photo of my dinner. In fact, nearly everyone at the table did the same thing. The wonderful people behind foodbuzz.com organized a fantastic event at Newport Beach’s Blanca for the SoCal featured publishers. We were treated to a great meal, tasty wine, and a chance to meet fellow food writers. I really enjoyed the diversity of people there. Some, like I, are fairly new at food blogging. Others have been doing it for quite some time now. There were foodies, cooks, creaters, reviewers, all at the same table. We all come from different walks of life- programmers, scientists, mothers, etc. As different as we might be, we all shared a passion for good food, and, it seems, taking pictures of the said food. It was a really killer experience. Meeting the other SoCal featured publishers was really exiting and inspiring. I learned something from everyone there. Special thanks to Kirsten and Ryan for organizing the event and taking great care of us! This one holds a special place in my heart. The food in college was bad. Very bad. On top of that, I was a very picky eater. Even at the tender age of 18, I knew that hot dogs and cereal were not a healthy diet. A quick call to mom was all it took. This Man’s Kitchen was born with this dish. 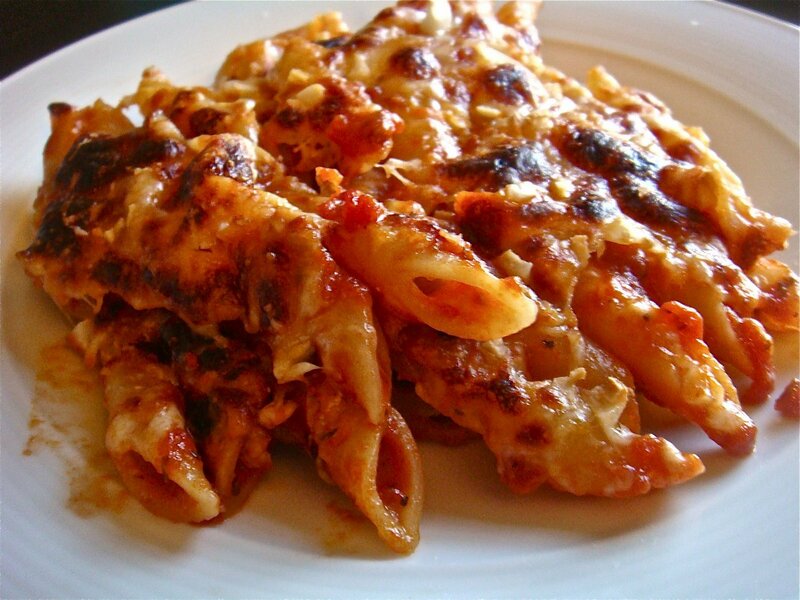 Add drained pasta to a standard-sized pie tin, or to your toaster’s baking pan. Bake at 450 until the cheeses begin to melt- around 6 minutes. Then broil until cheese bubbles and turns golden brown. *Be careful, it can go from beautiful to black in minutes, so keep an eye out. Summer in a bowl, made by the sun. At this point in the summer, you’ve probably grown tired of using tomatoes for the same things again and again. Quick sauces and caprese salads are wonderful, of course. But there comes a time for something new. 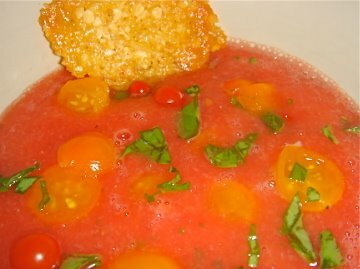 Here’s something you can make that will use your tomatoes in a different way, and cool you off during the dog days of summer. You don’t even have to do any cooking. Begin by peeling and seeding 2 lbs. of tomatoes. I used a combination of beefsteak, Japanese, and roma. The important thing here is to use only the most bursting with ripeness fruit. Tomatoes at the hight of tomatodom. Chop the garlic, snip the basil, and dice the serrano. Add a little salt & pepper to the mix, and, using your hands, squish it all together. Transfer to a cookie sheet. Cover with plastic wrap and place under the hot sun for three hours. The sunshine will gently break down the tomatoes, releasing the natural sugars. The plastic wrap will enhance this by creating a mini-greenhouse! After three hours, bring back inside and puree. Transfer to a bowl, and add the cherry tomatoes. Refrigerate for at least an hour. I like to serve this slightly below room temperature for best flavor. 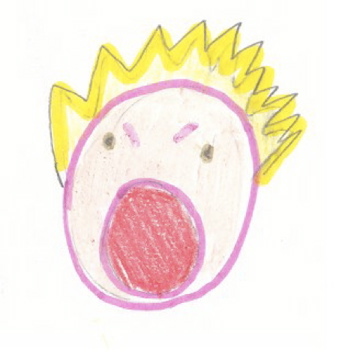 I had an improv teacher who, whenever your scene went haywire, would have you exclaim, with utmost joy and enthusiasm, “I FAILED!”. Sometimes, he’d have the whole class join in the celebration of failure. The point being, even if you fail there is something to gain. I find this to be especially true when it comes to food. Cooking is about experimentation. You have a great idea, find a killer recipe, and you make it. Sadly, the flavors didn’t come together as expected. It tastes like poop. We’ve all done it. Once, when trying to impress a girl, I decided to make smoked pork chops. The brine tasted great. The smoke was wonderful. The chops had a deep mahogany color. When it came time to eat, they tasted like a salt lick and had the texture of plastic. Not so good. Unimpressed. 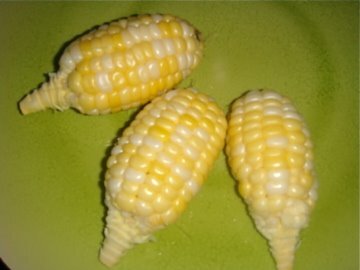 The picture above is corn, recently harvested from my garden. Corn, that is the size of a baseball. Ever seen corn the size of a baseball before? Probably not, because corn is meant to be a whole lot bigger. Your corn is also probably covered with rows of tasty kernels. My corn was not. Not at all. Well, I FAILED! Life goes on. As it turns out, you have to grow a lot of corn for the ears to grow as they’re meant to. Ten ears in an overturned shed is not enough. I put a lot of love into it, but it didn’t work out. One day, I’ll have my own field of dreams. For now, I’ll take a third run on growing dragon carrots. Yup, failed twice on those, too! Maybe this time I’ll get it right. Everybody, all together now, with joy: I FAILED! The government released documents today confirming a long-standing rumor that the Godmother of TV cooking shows was a spy during WWII. Ms. Child was on of thousands of Americans who worked abroad for the Office of Strategic Services, the predecessor to the CIA. One more notch on Julia Child’s bedpost of amazing. This vegan (gasp!) 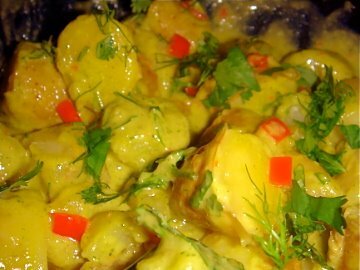 potato salad can be served warm or cold. I like to make extra, serve the first portion warm, then have it cold from the fridge the next day. If you feel like adding a little bacon, I say go for it. Of course, your vegan friends might be a little sad. Boil potatoes until fork tender, about 15 minutes. It’s important to use waxy potatoes, as they will hold their shape much better than fluffy baking potatoes. The texture will be way better, too. I really like using fingerlings for this. They have a wonderful flavor, and hold up well both hot and cold. While potatoes are boiling, make the dressing. Add vinegar, garlic, shallots, salt/pepper, mustard, and half of the fresh herbs. I find the best way to blend the olive oil in is by using a hand blender. Add oil a tablespoon at a time, blending between doses, until the dressing is complete. If you don’t have a hand blender, you can whisk the oil into the vinegar mix. Make sure to go slowly so the oil incorporates. After potatoes are cooked, drain and place in a large bowl. Chop potatoes into large chunks. Pour dressing over the chunks. Best to leave about 1/3 of the dressing on the side- you don’t want to over-dress. Add more if needed. Add remaining herbs to the mix, and toss. Sweet corn is one of the joys of summertime. As we enter August, corn is in high season. The tasty, giant stalks of grass are plump with sweet kernels. My favorite was to enjoy corn this time of year is to grill it. Screw wrapping it in foil, I’ve a better way. First step is to peel the husk back, all the way to the bottom, but not off. Remove the silks, and a layer of the outermost husk. Dispose of the silk, but save the husk. Tear the husk into a few long, thin strips. 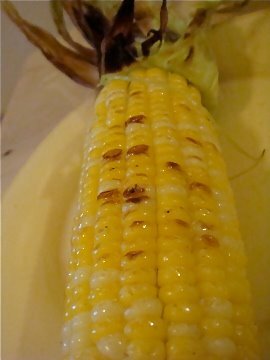 Rub corn with butter and salt. Return the husk to first position, and secure it by tying with the strips. 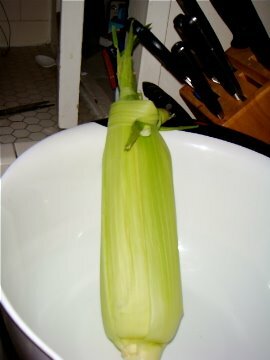 Submerge the corn in cold water for 30 minutes to an hour. Pat dry and place over hot coals. The husk will begin to brown, while the corn steams in it’s on deliciousness, aided by butter. After ten minutes, remove corn and tear off the husk. Careful, it’s hot! Apply more butter (if desired) and return to grill. As the kernels brown, turn the corn. Remove, adding salt/spices to taste.